Just yesterday I was posting that I was bewildered by what handsets HTC’s producing, how they differ, and what are just different names for the same thing. 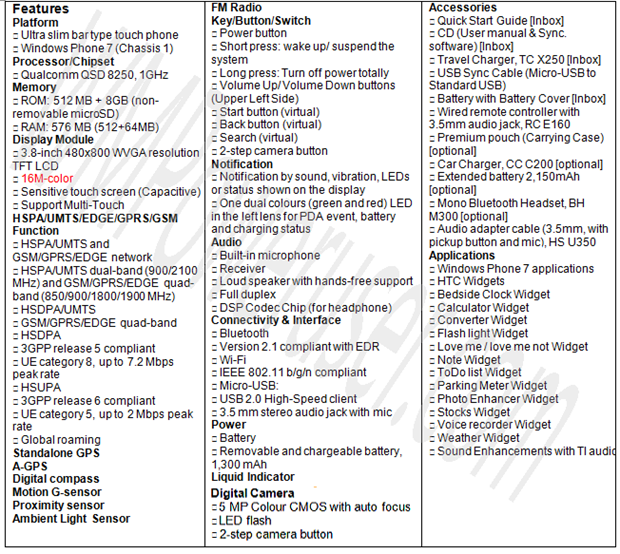 Well, this helps clear things up a little, the full European specs for the HTC 7 Trophy, also known as the HTC Spark. While it’s currently only shown to run on European networks, we hope that a US version is in the pipeline too. It’ll have a 3.8-inch screen, 8GB non-removable microSD card (what? ), 576MB of RAM, GPS, Compass, FM Radio, 1GHz chip, 5MP camera, 1300m Ah battery. The 8GB of storage is pretty underwhelming, especially as you can’t swap it out.